A team of researchers led by Scripps Institution of Oceanography at the University of California San Diego has created a scale to characterize the strength and impacts of "atmospheric rivers," long narrow bands of atmospheric water vapor pushed along by strong winds. They are prevalent over the Pacific Ocean and can deliver to the Western United States much of its precipitation during just a few individual winter storms. They are the source of most of the West Coast's heaviest rains and floods, and are a main contributor to water supply. For example, roughly, 80 percent of levee breaches in California's Central Valley are associated with landfalling atmospheric rivers. The scale, described Thursday in the February 2019 Bulletin of the American Meteorological Society, assigns five categories to atmospheric rivers (ARs) using as criteria the amount of water vapor they carry and their duration in a given location. The intention of the scale is to describe a range of scenarios that can prove beneficial or hazardous based on the strength of atmospheric rivers. The scale was developed by F. Martin Ralph, director of the Center for Western Water and Weather Extremes (CW3E) at Scripps, in collaboration with Jonathan Rutz from the National Weather Service and several other experts. It ranks atmospheric rivers from 1 to 5 and creates the categories "weak," "moderate," "strong," "extreme," and "exceptional." It uses amounts of water vapor within an atmospheric river as its basis and a period of 24 to 48 hours as its standard measurement of duration. When an AR lasts in an area for less than 24 hours, it is demoted by one category, but if it lingers for more than 48 hours, it is promoted. This approach is based on research showing that a combination of strong water vapor transport with long duration over a location, is what causes the greatest impacts. Unlike the hurricane scale, recently criticized for not representing adequately the impacts of slow-moving lower-category hurricanes, the AR scale builds in duration as a fundamental factor. "The scale recognizes that weak ARs are often mostly beneficial because they can enhance water supply and snow pack, while stronger ARs can become mostly hazardous, for example if they strike an area with conditions that enhance vulnerability, such as burn scars, or already wet conditions," say Ralph and co-authors in the paper appearing today in the February 2019 issue of the Bulletin of the American Meteorological Society. "Extended durations can enhance impacts." "The concept of ARs has directly benefited NWS operations in the West through better scientific understanding, more accurate precipitation forecasts, and a better vehicle for communicating impacts to our partners," said Rutz. "The AR scale is a significant step forward, providing forecasters with a tool to distinguish between primarily beneficial and primarily hazardous storms. I anticipate that this scale will be adopted and highly used." 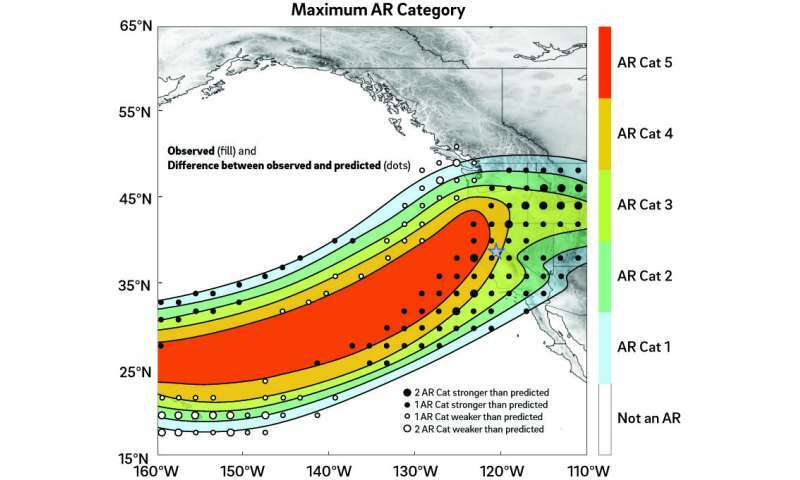 Previous analysis has shown that on the West Coast, the Oregon coast receives the most atmospheric rivers in the "extreme" range (AR Cat 4), averaging about one per year. Washington receives extreme atmospheric rivers about every two years, the Bay Area about every three years and Los Angeles every 10 years. The 1996-1997 atmospheric river that caused the largest flood damages in California since 1950 would be categorized as an "exceptional" AR storm. The strongest atmospheric river storms hitting the Southern California coast annually, typically fall in the "moderate" to "strong" range (AR Cat 2-3). 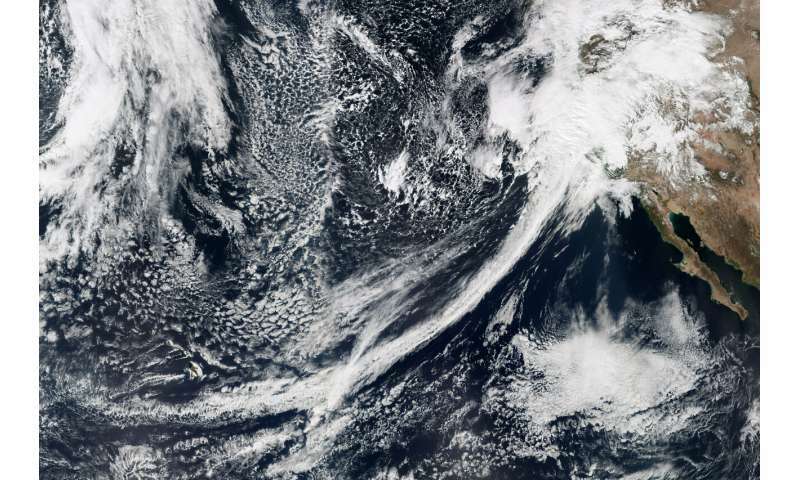 The researchers said that the atmospheric river scale is intended as a tool to increase situational awareness ahead of a major storm in a way that reflects conditions broadly in a region of roughly 50 km size. It is not intended to represent detailed conditions on smaller spatial scales where variable topography, land surface types, and vulnerabilities vary greatly and thus modulate storm impacts. "This scale enables improved awareness of the potential benefit versus hazard of a forecast AR," said co-author Michael Anderson of the California Department of Water Resources. "It can serve as a focal point for discussion between water managers, emergency response personnel and the research community as these key water supply and flood inducing storms continue to evolve in a changing climate." "Forecasters in the western U.S. have been using the concept of ARs in their forecasting for a few years now, and many have been looking for a way to distinguish beneficial from hazardous AR storms," said Rutz. "The scale was designed partly to meet this need, and it is anticipated that it will be used extensively."